Plain and striped canvas available. Plain and striped acrylics available. Plain and striped screen fabrics available. Plain and scalloped trims available. There is a fabric awning to suit most applications. Site visits are suggested. 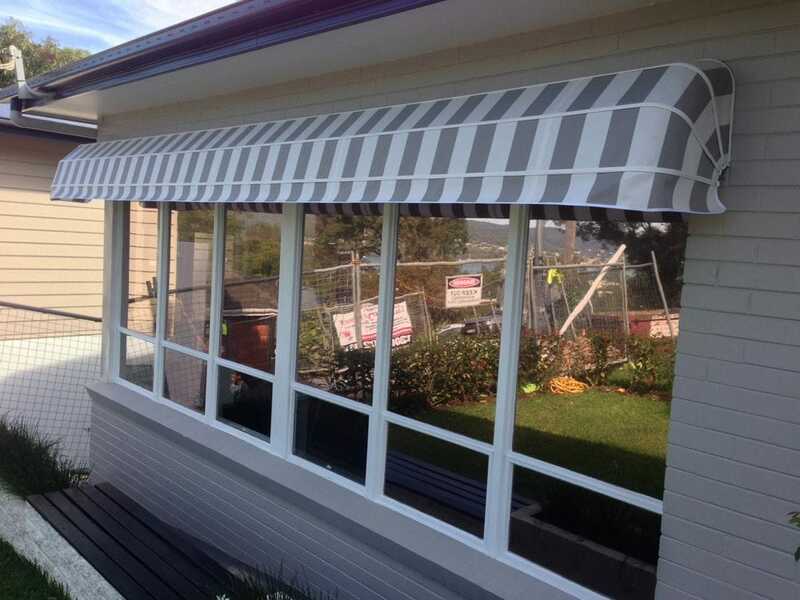 awnings up to 4500mm wide. We offer a free NO PRESSURE measure and quote with a trained window furnishing consultant inside your home or office. Contact us to organise a Quote or a Free In Home Measure and Quote. We are more than happy to quote over the phone or by email. Call us on 4324 8800 or you can come and see our Blinds, Shutters and Awnings showroom at Wyoming on the Central Coast. Rain blocking ability of Mode Privacy Outlook Mesh. Here is a short 80 second video showing how protective outlook screen fabric is in all weather conditions. In this video they point a hose directly at the screen that Premier Shades primarily use for the Cafe Blinds and Ziptrak external blinds. If you can see how the water falls down the side of the fabric, you can imagine how the rain would fall. Rain would not normally be coming in sideways like a hose. We use The Outlook screen fabric a lot in our external blinds as they can also let some air flow through and protect you from the heat (unlike PVC). They are not as good as PVC for rain, but can certainly protect you from light rainfall or rain that isn't coming directly at you. Premier Shades have a huge display in their showroom at Wyoming of Outlook screens and have ziptraks on display and operational using this screen. Wind reduction capabilities of Outlook Mesh.